I got a card yesterday from Tracy Medling. Tracy is a great painter and a great friend. We both moved to Portland from New Haven in the late 1970s. This morning I saw one of his paintings in Portland Magazine – three luminous red tomatoes. Tracy and I grew up as next-door neighbors in a row of brownstones in New Haven’s Wooster Square. Wooster Square is famous for its pizza – the aroma hangs over the neighborhood in late afternoon like a smoky Neapolitan fog. Immigrants from Naples and the Amalfi Coast settled in Wooster Square around the turn of the century. 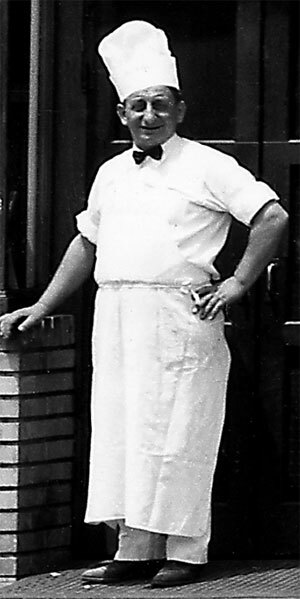 In 1925, Frank Pepe (left) opened his Pizzeria Napoletana (“Pepe’s” in New Haven-speak), and created a unique pizza characterized by a charred thin crust and luscious oblong contours. In my own little epicurious opinion, Sally’s is the champ, senza dubbio. But I have an enduring attachment to Pepe’s signature pizza, the White Clam, made with fresh Rhode Island cherrystone clams, mozzarella, olive oil, fresh garlic, oregano … and bacon. No tomatoes, please – this is classic “White Pizza” and when you eat it, you hear the angels singing. Legend has it that this divine pie was developed in the mid-1960s when Tracy and I were kids in New Haven. About the same age as Proust when he ate the sweetly iconic and clichéd Madeleines dunked in linden-flower tea. Today, Sally’s looks almost exactly as it did back in the day. The “blue” portrait of Frank Sinatra, the knick-knacks, the mementos. 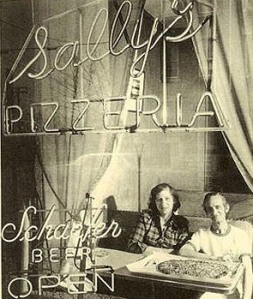 Our favorite waitress, Sal’s wife “Flo,” is now a grandmother, but she still holds court at Sally’s. (Flo served us pitchers of warm yellow beer before we were exactly legal and for this she is much beloved.) That’s Flo on the left. I think she really liked the neighborhood kids – it sure wasn’t the size of our tips. The pizza still arrives hot with its signature charred bottom on a big metal tray lined with parchment paper – wonderfully chewy and crisp with black bits that get all over your smiling face. They say you can still get Birch Beer soda here, another obscure Proustian memory with a peculiar wintergreen tang. This entry was posted in Food and Wine, Travel and tagged Amalfi Coast, Anson, artist, Columbus Green, Columbus Square park, Court Street, Doonesbury, downtown, James Beard, Little Italy, Maine, Naples, Neapolitan, New Haven, painter, Pepe's Pizza, pizza, Portland, Sally's Apizza, Tracy Medling, White Clam, Wooster Square, Wooster Street. Bookmark the permalink. In the north end of the Bronx in my Italian neighborhood we called it Ahbeets! But that was 1936. I have been addicted to them ever since. The writer was the love interest of many a young lad from our neighborhood, but she scorned us all and moved to Maine, as pretty a smile and wit to match as can be had on this green earth. from the non-artistic brother of Tracy.